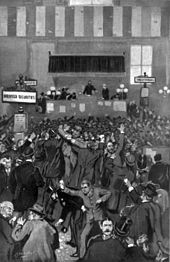 Drawing in Frank Leslie's of panicked stockbrokers on May 5, 1893. One of the causes for the Panic of 1893 can be traced back to Argentina. Investment was encouraged by the Argentine agent bank, Baring Brothers. However, the 1890 wheat crop failure and a coup in Buenos Aires ended further investments. In addition, speculations also collapsed in South African and Australian properties. Because European investors were concerned that these problems might spread, they started a run on gold in the U.S. Treasury. Specie was considered more valuable than paper money; when people were uncertain about the future, they stockpiled specie and rejected paper. During the Gilded Age of the 1870s and 1880s, the United States had experienced economic growth and expansion, but much of this expansion depended on high international commodity prices. To exacerbate the problems with international investments, wheat prices crashed in 1893. One of the first clear signs of trouble came on February 20, 1893, twelve days before the inauguration of U.S. President Grover Cleveland, with the appointment of receivers for the Philadelphia and Reading Railroad, which had greatly overextended itself. Upon taking office, Cleveland dealt directly with the Treasury crisis and successfully convinced Congress to repeal the Sherman Silver Purchase Act, which he felt was mainly responsible for the economic crisis. As concern for the state of the economy deepened, people rushed to withdraw their money from banks, and caused bank runs. The credit crunch rippled through the economy. A financial panic in London combined with a drop in continental European trade caused foreign investors to sell American stocks to obtain American funds backed by gold. The People's Party, also known as the 'Populists', was an agrarian-populist political party in the United States. From 1892 to 1896, it played a major role as a left-wing force in American politics. It drew support from angry farmers in the West and South. It was highly critical of capitalism, especially banks and railroads, and allied itself with the labor movement. Established in 1891 as a result of the Populist movement, the People's Party reached its zenith in the 1892 presidential election, when its ticket, composed of James B. Weaver and James G. Field, won 8.5% of the popular vote and carried five states (Colorado, Idaho, Kansas, Nevada and North Dakota), and the 1894 House of Representatives elections, when it won nine seats. Built on a coalition of poor, white cotton farmers in the South (especially North Carolina, Alabama and Texas) and hard-pressed wheat farmers in the Plains states (especially Kansas and Nebraska), the Populists represented a radical crusading form of agrarianism and hostility to elites, cities, banks, railroads, and gold. The Free Silver movement arose from a synergy of farming and mining interests. Farmers sought to invigorate the economy and thereby end deflation, which was forcing them to repay loans with increasingly valuable dollars. Mining interests sought the right to turn silver directly into money without a central minting institution. The Sherman Silver Purchase Act of 1890, while falling short of the Free Silver movement's goals, required the U.S. government to buy millions of ounces of silver above what was required by the 1878 Bland–Allison Act (driving up the price of silver and pleasing silver miners). People attempted to redeem silver notes for gold. Ultimately, the statutory limit for the minimum amount of gold in federal reserves was reached and U.S. notes could no longer be successfully redeemed for gold. Investments during the time of the panic were heavily financed through bond issues with high interest payments. Rumors regarding the National Cordage Company's financial distress (NCC was the most actively traded stock at the time) caused its lenders to call in their loans immediately, and NCC went into bankruptcy receivership as a result. The company, a rope manufacturer, had tried to corner the market for imported hemp. As demand for silver and silver notes fell, the price and value of silver dropped. Holders worried about a loss of face value of bonds, and many became worthless. A series of bank failures followed, and the Northern Pacific Railway, the Union Pacific Railroad and the Atchison, Topeka & Santa Fe Railroad failed. This was followed by the bankruptcy of many other companies; in total over 15,000 companies and 500 banks, many of them in the West, failed. According to high estimates, about 17%–19% of the workforce was unemployed at the panic's peak. The huge spike in unemployment, combined with the loss of life savings kept in failed banks, meant that a once-secure middle-class could not meet their mortgage obligations. Many walked away from recently built homes as a result. The 1896 Broadway melodrama The War of Wealth was inspired by the panic of 1893. As a result of the panic, stock prices declined. Five hundred banks closed, fifteen thousand businesses failed, and numerous farms ceased operation. The unemployment rate hit 25% in Pennsylvania, 35% in New York, and 43% in Michigan. Soup kitchens were opened to help feed the destitute. Facing starvation, people chopped wood, broke rocks, and sewed by hand with needle and thread in exchange for food. In some cases, women resorted to prostitution to feed their families. To help the people of Detroit, Mayor Hazen S. Pingree launched "Pingree's Potato Patch," which were community gardens for farming. The Sherman Silver Purchase Act of 1890, perhaps along with the protectionist McKinley Tariff of that year, has been partially blamed for the panic. Passed in response to a large overproduction of silver by western mines, the Sherman Act required the U.S. Treasury to purchase silver using notes backed by either silver or gold. President Grover Cleveland, a Democrat, was blamed for the depression. He in turn blamed the Sherman Silver Purchase Act. Gold reserves stored in the Treasury fell to a dangerously low level. This forced President Cleveland to borrow $65 million in gold from Wall-Street banker J.P. Morgan and the Rothschild banking family of England. Black Friday (1869) – also referred to as the "Gold Panic of 1869"
^ "The Depression of 1893". eh.net. Retrieved 2019-02-27. ^ Romer, Christina (1986). "Spurious Volatility in Historical Unemployment Data". Journal of Political Economy. 94 (1): 1–37. doi:10.1086/261361. ^ Nelson, Scott Reynolds. 2012. A Nation of Deadbeats. New York: Alfred Knopf, p. 189. ^ "IN RE RICE". Findlaw. ^ James L. Holton, The Reading Railroad: History of a Coal Age Empire, Vol. I: The Nineteenth Century, pp. 323–325, citing Vincent Corasso, The Morgans. ^ a b Whitten, David O. "EH.Net Encyclopedia: Depression of 1893". eh.net. Archived from the original on 2009-04-27. Retrieved 2009-04-20. ^ Cynthia Clark Northrup (2003). The American Economy: Essays and primary source documents. ABC-CLIO. p. 195. ^ Hoffman, Charles. The Depression of the Nineties: An Economic History. Westport, CT: Greenwood Publishing, 1970. p. 109. ^ Parshall, Gerald. "The Great Panic Of '93." U.S. News & World Report 113.17 (1992): 70. Academic Search Complete. Web. 26 Feb. 2013. ^ Harold U. Faulkner (1959). Politics Reform and Expansion: 1890–1900. pp. 143–44, 155–57. Brice, Lloyd Stephens, and James J. Wait. “The Railway Problem.” North American Review 164 (March 1897): 327–48. online at MOA Cornell. Noyes, Alexander Dana. "The Banks and the Panic," Political Science Quarterly 9 (March 1894): 12–28 in JSTOR. Shaw, Albert. "Relief for the Unemployed in American Cities," Review of Reviews 9 (January and February 1894): 29–37, 179–91. Stevens, Albert Clark. "An Analysis of the Phenomena of the Panic in the United States in 1893," Quarterly Journal of Economics 8 (January 1894): 117–48 in JSTOR. Barnes, James A. John G. Carlisle: Financial Statesman (1931). Barnes, James A. (1947). "Myths of the Bryan Campaign". Mississippi Valley Historical Review. The Mississippi Valley Historical Review, Vol. 34, No. 3. 34 (3): 383–394. doi:10.2307/1898096. JSTOR 1898096. Bent, Peter H. (2015). "The Political Power of Economic Ideas: Protectionism in Turn of the Century America". Economic Thought. 4 (2): 68–79. .
Destler, Chester McArthur. American Radicalism, 1865–1901 (1966). Dewey, Davis Rich. Financial History of the United States (1903). online. Dighe, Ranjit S. ed. The Historian's Wizard of Oz: Reading L. Frank Baum's Classic as a Political and Monetary Allegory (2002). Dorfman, Joseph Harry. The Economic Mind in American Civilization. (1949). vol 3. Faulkner, Harold Underwood. Politics, Reform, and Expansion, 1890–1900. (1959). Feder, Leah Hanna. Unemployment Relief in Periods of Depression ... 1857–1920 (1926). Friedman, Milton, and Anna Jacobson Schwartz. A Monetary History of the United States, 1867–1960 (1963). Hoffmann, Charles (1956). "The Depression of the Nineties". Journal of Economic History. 16 (2): 137–164. JSTOR 2114113. Hoffmann, Charles. The Depression of the Nineties: An Economic History (1970). Jensen, Richard. The Winning of the Midwest: 1888–1896 (1971). Josephson, Matthew. The Robber Barons New York: Harcourt Brace Jovanovich (1990). Kirkland, Edward Chase. Industry Comes of Age, 1860–1897 (1961). Lindsey, Almont. The Pullman Strike 1942. Littlefield, Henry M. (1964). "The Wizard of Oz: Parable on Populism". American Quarterly. American Quarterly, Vol. 16, No. 1. 16 (1): 47–58. doi:10.2307/2710826. JSTOR 2710826. Nevins, Allan. Grover Cleveland: A Study in Courage. 1932, Pulitzer Prize. Rezneck, Samuel S. (1953). "Unemployment, Unrest, and Relief in the United States during the Depression of 1893–97". Journal of Political Economy. The Journal of Political Economy, Vol. 61, No. 4. 61 (4): 324–345. doi:10.1086/257393. JSTOR 1826883. Ritter, Gretchen (1997). "Silver slippers and a golden cap: L. Frank Baum's The Wonderful Wizard of Oz and historical memory in American politics". Journal of American Studies. 31 (2): 171–203. doi:10.1017/S0021875897005628. Rockoff, Hugh (1990). "The 'Wizard of Oz' as a Monetary Allegory". Journal of Political Economy. The Journal of Political Economy, Vol. 98, No. 4. 98 (4): 739–760. doi:10.1086/261704. JSTOR 2937766. Romer, Christina (1986). "Spurious Volatility in Historical Unemployment Data". Journal of Political Economy. 94 (1): 1–37. doi:10.1086/261361. Schwantes, Carlos A. Coxey’s Army: An American Odyssey (1985). Shannon, Fred Albert. The Farmer’s Last Frontier: Agriculture, 1860–1897 (1945). Steeples, Douglas, and David O. Whitten. Democracy in Desperation: The Depression of 1893 (1998). Strouse, Jean. Morgan: American Financier (1999). White; Gerald T. The United States and the Problem of Recovery after 1893 (1982).